Why is South Africa’s President So Keen on Undermining Property Rights? Last week, South African President Cyril Ramaphosa delivered his annual State of the Nation address. In the long speech, the President made clear that his party, the African National Congress (ANC), will be continuing, and even “accelerating” the process of legalizing land expropriation without compensation. Pursuing a policy of land expropriation will severely weaken and undermine property rights in South Africa. Without strong property rights, economic prosperity is not only improbable but nigh impossible. Section 25 currently mandates that if the land is taken away from a property owner, “compensation…must be just and equitable.” But late last year, the South African Parliament, with Ramaphosa’s support, adopted a report by the Joint Constitutional Review Committee that declared the constitution should be changed to remove “just and equitable” compensation requirement. Unfortunately, according to the International Property Rights Index, South Africa’s property rights have already become weaker over the last few years– falling from a position of 20th out of 125 countries in 2007, to 37th place today. The precise wording of the amendment is not yet clear, and a special advisory panel is expected to submit a report on the precise phraseology of the change in late March. However, based on Ramaphosa’s and the joint review committee’s previous statements, the change will “make explicit” that they feel “is already implicit”—that the constitution must allow expropriation without compensation of private land. As I noted in a previous article on the same topic, Ramaphosa has claimed that undermining property rights will somehow turn South Africa into “the garden of Eden” and will boost economic growth whilst reducing poverty. These comments couldn’t be further from the truth, but with the President’s recent reaffirmation of his commitment to land expropriation, now is a good time to look at the correlation between strong property rights and economic prosperity. Using data from the Fraser Institute’s Economic Freedom of the World report, I have split the 162 countries that the report analyzed in 2016 into deciles. Each decile represents 10 percent of the countries measured based on the strength of their property rights. I then correlated these deciles with their average Gross Domestic Product (GDP). GDP data taken from WorldBank using 2016, the most recent year the Fraser Institute has data. The countries in the decile with the strongest property rights have an average income of over $55,457. That figure is 125 percent higher than those nations in the second most property-friendly decile. 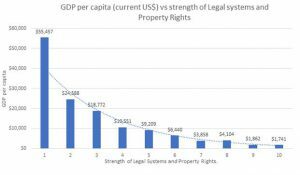 Similarly, the countries with the strongest property rights have an annual income 31.8 times higher than those nations with the weakest property rights. One reason property rights remain crucial to economic growth is that without the former, business and individuals are unwilling to invest in a country where their property isn’t protected. The World Bank has indicated that South Africa’s weakened property rights have already resulted in increased capital flight, social fragility, and pervasive corruption. In pursuing land expropriation, Ramaphosa is expected to accelerate this already damaging trend. Interestingly, of the four other aspects of economic freedom that the report covers—the size of government, sound money, freedom to trade internationally, and regulation—it is property rights that has the strongest correlation with economic prosperity. This means that even if Ramaphosa had the best possible economy-boosting policies, without strong and secure property rights, it would mean nothing. We must hope Ramaphosa, and the ANC realize the economic devastation that weakened property rights will bring to South Africa. But alas, the pro-expropriation politicians have ignored every other warning that has explained the intrinsic link between property rights and economic prosperity, so why should this warning be any different? Alexander C. R. Hammond is a Senior Fellow at African Liberty. He is also a researcher at a Washington D.C. think tank and contributor to Young Voices. Liberty is best enjoyed with friends, share! Is it Time for Ghana to Truly Lift its Indigenous Banks? Life is Getting Strenuous for Teenage Girls in Kenya. Who’s to Blame?